It's difficult to create 3D images on a 2D surface because, well, you're missing a whole dimension. Enter Beyond, a collapsible input device that virtually extends the pen into the screen to create the 3D effect. Beyond was created by the MIT Media Lab and is a pretty genius, glasses-less way to create 3D on a 2D surface. 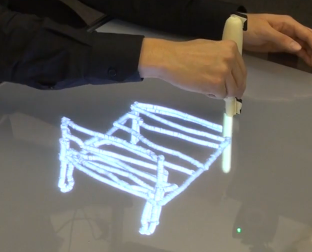 The 3D on 2D surface magic uses the collapsible pen, a tabletop display, an infrared position tracking system to track the pen, and a camera to track the user's face so it can tweak the angle of the 3D effect. The collapsible pen is actually rather simple, with only basic electronics and 2 infrared markers behind the magic.